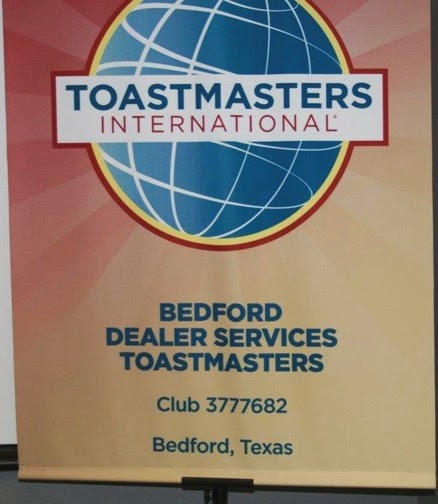 Bedford Dealer Services Toastmasters chartered April 29, 2014 and held their Charter Celebration on Tuesday, July 1st. You can see the photos from the meeting on the District 25 Facebook page. Sonia Leza, Division C Governor, represented the District at the celebration and recognized the 21 charter members. Club Sponsors, Duane Fontenot and Edgar Muganda, were also in attendance as well as their Club Mentor, Jesse Torres. The club’s officers are: President – Roosevelt Williams, VP Education – Marie Riddick, VP Membership – Byron Strickland, VP Public Relations – Curt Reese, Secretary – Barbara Mullins, Treasurer – Richard Torres, and Sergeant at Arms – Golden Mwase.